Nothing says "bridal" quite like lace and tulle! 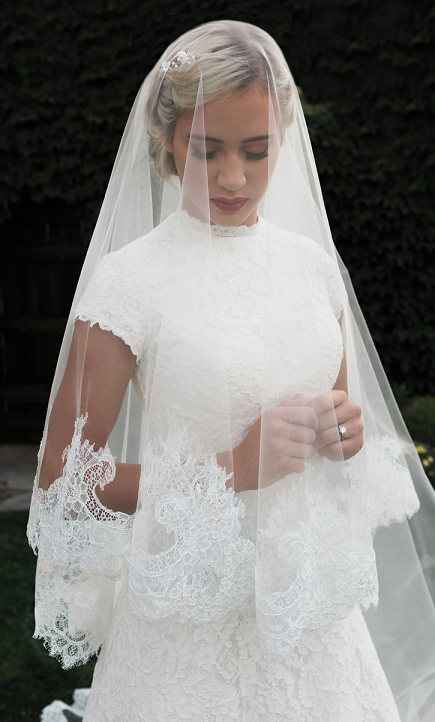 Our lace wedding veils will add that extra touch of romance you are looking for. Whether you are wanting a full or partial lace edge or just touches of lace throughout the veil, we have the style for you. We have beautiful lace veil selections from Elegance by Carbonneau, LC Bridal, Mariell, JL Johnson Bridal, FC Bridal, Ansonia Bridal, Elena Designs, enVogue and Symphony Bridal. Featured here is one of our cathedral mantilla lace veils V1998C-M. Need help choosing your wedding veil? Contact us and we'll be happy to help!